With todays fast paced, high stressed way of life a broken appliance can be a real problem for a family. When your kids need clean clothes for school and your washer isn’t working what options do you have? Appliance repair is often less expensive than a new purchase and with today’s prices we are all trying to watch our finances. So the next time an appliance is making a strange noise, you find a puddle of water by your refrigerator, or you take your dinner from the oven and it is still cold, give us a call!!! We have been providing Rhode Island and Southern MA with Excellent Customer Service / Quality Repair Work since 2001. 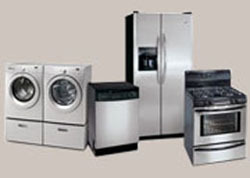 G&R’s Appliance Repair performs dispatch services for Lowes, S&W TV and Appliance, and Bellingham Electric. You will find our service technicians to be polite and courteous, with vast skills in troubleshooting and diagnosing your broken appliance. Their work is of the highest quality offering the utmost respect while performing the repair services at your residence. When your appliance is not functioning properly ignoring it can only cause further damage to the unit. Why spend more money on a replacement unit when our professional services are affordable, convenient, and eco-friendly? Call our office today and speak to Tim to set up an appointment. You can also send us an email or submit the service request form on this site and Tim will get back to you to schedule a service call. 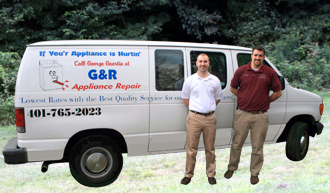 "When Your Appliance Is Hurtin’ Call George Guertin."